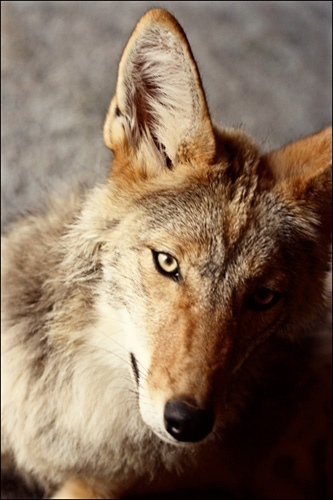 This rather handsome four-foot is Charlie, a Wyoming coyote who lives with a tomcat, a hound, and a really nice lady. Coyotes are native to my area, I saw four last night starting about dusk. But I've never had much luck getting pictures. Maybe because I like watching them too much to remember my camera. Coyotes are fast and are amazing jumpers. Mostly you hear them instead of seeing them. And yes, I love howling with the coyotes. Drives the dogs nuts. p.s. This isn't my Thursday entry, this is a just because I can.